So 2013 is here. For reals. Today, us, old calendar peoples, are celebrating the arrival of the New Year. I think as of today I will be able to jot down the correct date – it always takes me about two weeks to get used to the number-change. Also, as of today, I will feel that much more pressure to make some personal changes. I need something new, you know? Anything. But, I have a love and hate relationship with change; I love to find out the unknown, but hate not knowing the unknown. Make sense? As soon as I figure out the changes that I want to make, I will let you know. However, looks like there’s one thing I won’t be changing; my love for desserts. That was a conscious decision. It always is. I made this Banana Foster Cheesecake for a get-together with my aunt’s family. They dubbed me as the cheesecake dessert queen. I simply dub me as just the dessert fiend. Give me cake or give me death! This was one of those, let me throw my favorite things together, banana foster sauce and cheesecake, and hope for a positive outcome. I do that quite often – most of the time it works, but there are those times that it doesn’t. Cranberry white hot chocolate anyone? Ewwwww! I really need to forget about that experience. In a small bowl mix graham cracker crumbs, sugar and butter; press the mixture onto the bottom of a 9x9 inch dish or pan. Put the dish in the freezer for 15 minutes. In a mixing bowl, whisk together the pudding mixes and the milk for 2 minutes. Spread the pudding over the graham cracker crust. Put back in the freezer. In a medium sized mixing bowl, combine the cream cheese and the powdered sugar; beat until well blended. Add in the whipped topping and vanilla; continue to beat until thoroughly combined. Spread the cream cheese mixture over the pudding layer. Put it back in the freezer for 30 minutes, or until set. Melt the butter in a large frying pan over medium-high heat. Stir in the light brown sugar and let cook until bubbly. Pour in the heavy cream; stir and continue cooking. Mix in the bananas and pecans; continue to cook until hot and bubbly. Remove from heat and spread over the cheesecake. Cut the cheesecake into bars and serve. You can also serve the banana foster on the side. There are a couple of variations to this dessert: You may want to go ahead with the layer of pudding, or not. That is your decision. 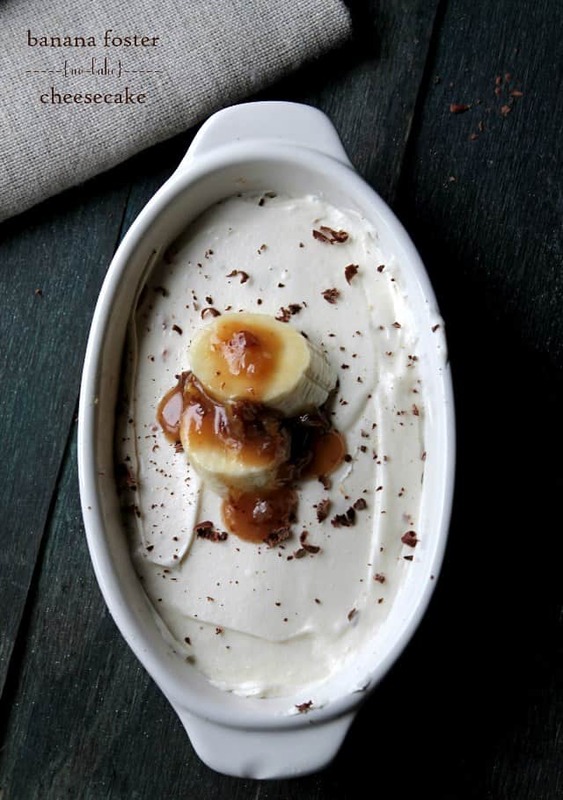 Also, you may or may not want to fold in 1/2 cup of banana foster into the cream cheese mixture. Again, that’s up to you. 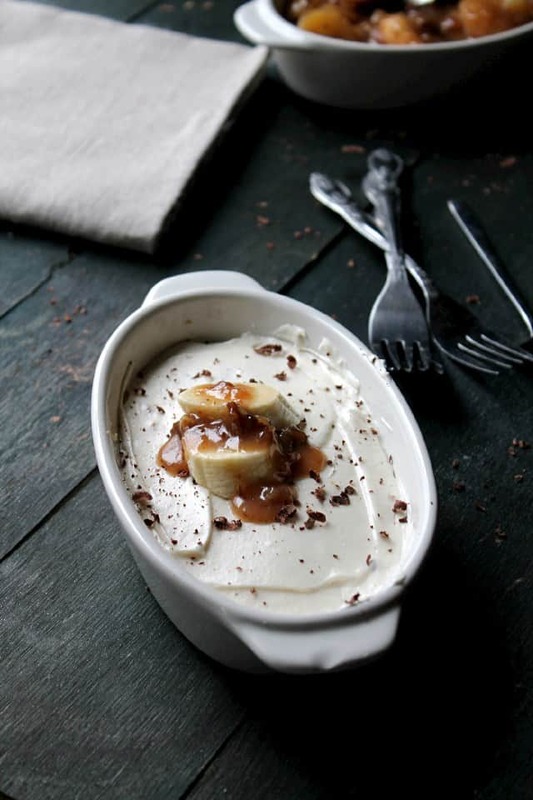 For a prettier presentation, serve the banana foster sauce on the side and spoon as much of it as one desires. When you say the recipe serves 16, do you actually serve a 2-inch square to each guest? Hi Leah! Thanks so much for pointing out my mistake!! It’s been over a year since I posted this recipe and I never noticed that! IT should read, “Serves 9”. 🙂 Again, thank you! 50 No Bake Treats - Chocolate Chocolate and More! Could this be made in a springform pan like a normal cheesecake or a pie pan? Yes, you can absolutely go ahead and make it in a springform pan. SO glad to hear that!! I am happy you enjoyed it! sounds yummy! love your photos. OMG this looks incredible!!! I want to eat that entire dish! 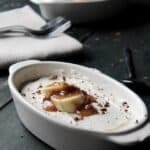 I love all desserts with banana and this one is no exception. I’ve never tried no-bake cheesecake. Hmmm, must change this soon. 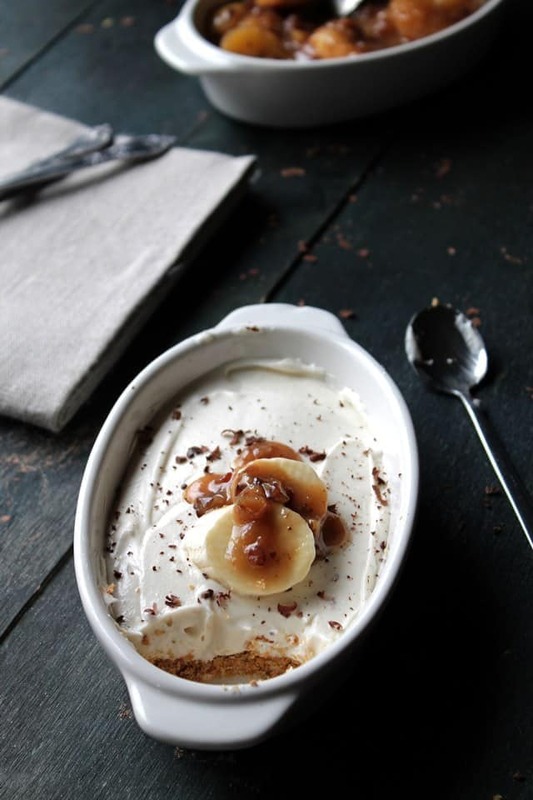 You have combined several of my favorite things – cheesecake, bananas foster, and not baking. It’s a beautiful thing. Never mind forgetting to write down 2012, I still feel like Halloween was a week ago- always in delayed reaction mode. I love bananas foster! One of my FAVE desserts! And this is no-bake — oh, even better!